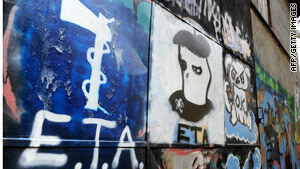 ETA is blamed for more than 800 deaths in its long fight for Basque independence in northern Spain. Madrid, Spain (CNN) -- Spanish police early Tuesday arrested nine people for suspected links to the Basque separatist group ETA, the first such detentions since ETA declared a unilateral cease-fire earlier this month, an Interior Ministry spokesman told CNN. Spain's Interior Minister said last week that police would not ease up on ETA, blamed for more than 800 deaths in its fight for Basque independence, despite its cease-fire declaration on September 5. The government and most Spanish political parties received ETA's cease-fire announcement with scepticism, because the group has used previous cease-fires to regroup its forces for subsequent shootings and bombings. In the predawn hours Tuesday, Civil Guards arrested five men and four women in various northern regions of Spain, including in the three provinces which comprise the Basque country. The nine are suspected of leading an outlawed group, Ekin, which authorities link directly to the outlawed ETA. The latter, in turn, is listed as a terrorist group by the United States and the European Union. Spain's National Court in 2007 convicted 47 people in a case that aimed to dismantle Ekin. At the time, the court called Ekin "part of the heart" of ETA, not a mere satellite group. The Supreme Court later overturned nine of those convictions.